Inner diameter 21 mm, as a counterpart to magnets, not a magnet! 10 pcs. 1,42 EUR ea. from 20 pcs. 1,34 EUR ea. from 40 pcs. 1,28 EUR ea. These metal discs with an edge are the perfect magnetic bases for our (e.g.) pot magnets or magnetic hooks. They are countersunk and can be fastened with a fitting countersunk screw to create an even support area. The edge of these metal discs prevents the magnet from sliding down if attached in a vertical position, which counteracts the shear force and maintains a high adhesive force. Note: Once a magnet of suitable size (e.g. CSN-20) sits on the disc, it is hard to remove thanks to the edge. Therefore, make sure you first attach the metal disc and the magnet to the desired object (or screw in the hook/grommet/handle). The metal discs are not rustproof and hence not suitable for outdoor use. 20 x 20 x 3 mm, as a counterpart to magnets, not a magnet! 10 pcs. 0,35 EUR ea. Ø 20 mm, as a counterpart to magnets, not a magnet! 10 pcs. 0,40 EUR ea. 10 pcs. 0,32 EUR ea. 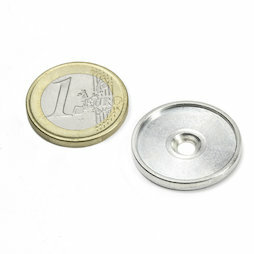 Inner diameter 17 mm, as a counterpart to magnets, not a magnet! 10 pcs. 1,31 EUR ea. Inner diameter 26 mm, as a counterpart to magnets, not a magnet! 10 pcs. 1,53 EUR ea. Ø 23 mm, as a counterpart to magnets, not a magnet! 10 pcs. 0,37 EUR ea. 1 pc. 3,42 EUR ea. 1 pc. 3,14 EUR ea. 1 pc. 2,58 EUR ea. 1 pc. 3,29 EUR ea. 1 pc. 3,63 EUR ea. 5 pcs. 2,21 EUR ea. 5 pcs. 1,58 EUR ea. 1 pc. 3,38 EUR ea. 1 pc. 2,11 EUR ea. 1 pc. 3,08 EUR ea.